I’m feeling very, um, old school lately. I’m sick of the new diets, the new fads, vegan or gluten free food. I’m standing firm and looking straight back. I want meat pie, bangers and mash, millionaire shortbread and today; the Cornish pasty. There’s a long, hardworking, eat what’s available history to the Cornish pasty. I try to pay some homage to those women who made these for their husbands heading to the mines back in the day and try not to fancy it up at all. Sometimes good food is, quite simply, good food. The good food is local, seasonal and the very best of the best stuff to cook with. This is my version, I hope the Cornish wives would be proud. Wandering Sprouts made me realize, delighted, it's winter vegetable time. I am about to sign up withJohnson's Backyard to enjoy the local goodness of my favorite time of year. I know a few people who are fans and luckily handoff the vegetables they can't identify to me! I simply have to sign up and get my own boxes. I think I prefer the winter veggies and am a fan of all of them. Austin doesn't give much Fall weather so I take advantage and cook up a storm when the season hits. The most time consuming, active participation of this is the chopping. Put on a cool cd, your favorite radio station or plug your ipod into your head, it's not that long and you'll truly feel like you've been involved! I make it in a cuisinart because I can and because, well the Cornish wives would have too, if given the opportunity. I also weigh, sorry about that. 1 extra large egg and a splash of milk, I’d guess 2 Tbsp. I pulse the flour and salt, add the fat and pulse until it’s sandy looking then break in an egg and the milk and turn it on until it turns into a ball. Wrap in plastic and put in the fridge for a bit. OR you can unroll a delicious package of the pre-made stuff. I will give you amounts I used today but you can simply adjust by what you like, it’s the percentage of half meat to veggies that’s really the only big deal. You can use ANY winter vegetable, sweet potatoes, butternut squash, pumpkin, kohlrabi. I used carrot, onion, swede, potato and leek because I love them and they were what was in the fridge. 1.5 lbs chuck steak chopped small. Chop everything small and mix. You can see the percentage of onion/leek to swede to potato. Keep the pieces tiny but not ground, season heavily with salt and pepper and when you think it’s seasoned enough, give it one more turn around. Roll the pastry and cut into 6′ rounds. Lay a line of the mixture down the middle and egg wash the entire circle, lift the sides and seal tightly along the top. Brush with egg and bake at 425 for 45 minutes. If they start to darken too much, lay foil loosely over them. These are fantastic eaten warm or room temperature or cold. I always serve them with Heinz baked beans (in tomato sauce) which I get at my local import store. Some foods simply must be eaten together. I always have loads of filling left and I put it in a ziplock bag in the fridge. I will assembly line make more of these tomorrow, smaller for lunches or snacks and use up the filling. 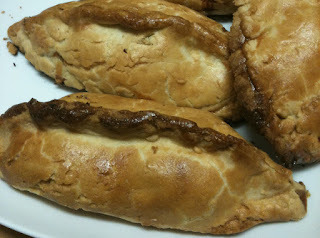 The pastry made 5 healthy pasties today and I simply wasn’t in the mood to make more. You CAN if you would like bake this in a large pie but I don’t think it’s nearly so good for some reason. I hope you make these and enjoy these and remember that old school is the new cool kid in town. Go to wherever the vegetables are local and seasonal and you'll be delighted with the results.